How can marketers better connect with people we hope will become our customers? Over the past year, I’ve been researching why there’s such a disconnect between marketing and customers so I can understand how to bridge that gap. Why? Because right now, the trust gap between marketers and customers has never been bigger. And this survey by Hubspot showed that only 3 percent of people surveyed consider marketers and salespeople trustworthy. Yikes. You may be asking yourself: how can things get better? So, I’ve been stewing on this for a while, and I could use your help and input on this because it affects all of us in sales and marketing. You see, I’ve worked in the world of complex sales, B2B marketing, and lead generation for two decades. And lately, I’ve been doing self-reflection as I’m working on a new company which you’ll hear more about soon. I think we marketers can be cynical and even snarky at times. We know good marketing. We know when something is legit. And we have well-tuned B.S. meters. It’s harder for me is to detect my own B.S., so I depend on people I trust to give me feedback. And at times, I’m told I’m full of it. That’s ok. It’s part of learning and growing. I think it’s easier for us in marketing to talk about what we’re comfortable with which is the product/service we sell. And we LOVE to talk them. But what I’m not very good at is understanding what motivates our customer and how to best talk to them. He’s not alone. I’ve done the same thing. This is one part problem we face in marketing and sales. And as you’ll see much of problem is self-inflicted. The big part of the problem is the words and jargon we choose in marketing and sales to describe what we do and the people we’re doing it for. Why? Because our words affect how we think. It’s something linguists call the Sapir-Whorf hypothesis which suggests that the words and the language we choose influences our thinking. I understood this intuitively but I don’t know that I’ve helped much. A decade ago, I wrote the book Lead Generation for the Complex Sale and it succeeded beyond my hopes. Back then, I wrote that marketing and sales come down to one thing: starting and growing relationships. And I still believe that’s true. To help, I’ve written about things like leads are people. Be human. Be authentic. Use empathy. But I realize that didn’t articulate the problem which is the words we use in the sales and marketing are object-centered, not people-centered. In my experience, our words express more than our thoughts and feelings. They reflect our motivations and values. And our customers feel them. This is why customer empathy is essential. But more than that, our words influence brain function i.e. how we think. Case in point, Andrew Newberg, M.D., and Mark Robert Waldman the authors of Words Can Change Your Brain confirm this through their extensive research. In sum, their research shows that our words actually change brain function and we are astonishingly unskilled when it comes to our understanding and communicating with others. According to Newberg and Waldman, “We communicate in so many different ways and in so many situations, but if we don’t bring self-reflective consciousness into the equation by reflecting on what we say before we say it, we’ll fail to reach the depths of intimacy and cooperation that we are capable of.“ You can read more about how words influence our brain here. For example, the minute I call someone a “lead” or “prospect,” I turn them into an object in my mind. And when I see someone as an object, I treat my marketing as something I DO to people rather than something I do FOR them. We objectify people when we use jargon like leads, prospects, suspects, conversions, opportunities, pipeline, MQLs, SQLs and more. We also use phrases like, “crush your quota,” “lead magnets, “wins,” ”closes,” “deals,” and more. When we put ourselves in our customers’ shoes and use empathy, we can begin to see how we unwittingly talk in a way that dehumanizes people and treats them as objects. Nobody wants to be treated as an object to convert. Instead, we need to address others as thinking and feeling people with individual needs. So how can we identify with others and connect on a human level? It’s no wonder the perception of marketers and sellers is negative, and we have a trust gap. And we’re due for a change. It starts with the words we use which ultimately affects how we think and act towards others. We need to think about how we can connect in a more human and engaging manner. We have this incredible capacity to influence people positively or negatively. That’s why we need to find congruency in the words we use and the ultimate purpose of marketing which is to help start and grow customer relationships. To do this, immerse yourself in your customer’s world and think from their experience. Begin by looking at what you see and hear. And then consider the words you use from your client’s perspective. This will help inspire new language. Also, use of words that people centered. For example, instead of leads, you can talk about change makers, potential customers, future customers, future advocates instead. See what I mean? There’s so much else that I’d like to say, but I want to close by asking you two questions. 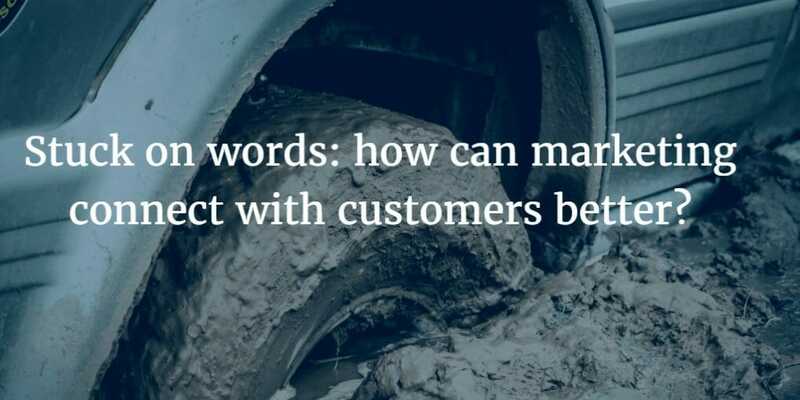 How can you change the words that you use to describe customers and future customers? How can we do to change the way we talk about what we do inside (an outside) our companies to treat people like humans rather than objects? Based on the words and jargon we use, it’s no wonder the perception of marketers and sellers is negative, and we have a trust gap. It’s time for a change.